How tall is Mary-Kate Olsen? Mary-Kate Olsen (born June 13, 1986) is an American actress, fashion designer, producer, author, and businesswoman. She co-founded luxury fashion brands The Row, Elizabeth and James, and the more affordable lines Olsenboye and StyleMint alongside her fraternal twin sister Ashley Olsen. Olsen pursued acting independently as an adult until 2012. She is the older sister of actress Elizabeth Olsen. Mary-Kate was born in Sherman Oaks, Los Angeles, California, the daughter of Jarnette "Jarnie", a personal manager, and David "Dave" Olsen, a real estate developer and mortgage banker. Along with her twin, Ashley, she has an older brother, Trent, a younger sister, Elizabeth Olsen, and two half siblings from her father's second marriage. Olsen's parents divorced in 1996. Along with Ashley, Olsen was cast at the age of nine months to share the role of Michelle Tanner on the ABC sitcom Full House. The Olsen twins portrayed Michelle throughout the series' 1987-95 run. In the early 1990s, she and Ashley established a company, Dualstar, which produced a long string of TV movies and direct-to-video releases featuring the girls. The Olsens continued to release direct-to-video films up to the early 2000s, along with starring in the 1995 feature film It Takes Two. In 1997, the Olsen twins guest starred in an episode of Sister, Sister, alongside rival twin actresses Tia Mowry and Tamera Mowry. After Full House, the sisters starred in two other sitcoms (Two of a Kind and So Little Time) and an animated series (Mary-Kate and Ashley in Action!). The former lasted one season while the latter ran for two seasons. These ventures, combined with an array of licensing deals for their names and likenesses, made Olsen wealthy at a young age. In 2004, Olsen's wealth was estimated at $137 million. Olsen and her sister became co-presidents of Dualstar upon their eighteenth birthday. Olsen's first solo acting appearance was in the movie Factory Girl, released in December 2006. Olsen's one short scene was ultimately cut from theatrical release, but was included on the film's DVD. In 2007, the sisters said that if they became involved in movies together again it would be as producers. Olsen had a recurring role on Weeds . In 2008, she appeared in The Wackness. At the Sundance Film Festival, Academy Award-winner Sir Ben Kingsley, her co-star' praised her. In 2008 Olsen also made a guest appearance on the ABC comedy Samantha Who? as a self-destructive girl that Samantha tries to help. Olsen appeared in the motion picture adaption of the Alex Flinn novel Beastly. Beastly was Mary-Kate's final acting project. In March 2012, both Mary-Kate and Ashley indicated their interest to retire as actresses in order to focus on their careers in fashion. Mary-Kate and Ashley felt that their futures were in fashion, and not in acting. They discussed wanting to open a store as one of their future fashion-based endeavors. In 2015 it was announced that John Stamos signed on with Netflix to produce and co-star in Fuller House, a spin-off Full House that would reunite the original cast members for a 13-episode series. Mary-Kate and Ashley originally announced in May 2015 that they will not reprise their role as Michelle Tanner. Nickelodeon acquired the rights to the Olsen twins' video library in 2015. In 1993, following Mary-Kate and Ashley's success on Full House, a limited liability company, Dualstar was created to produce Mary-Kate and Ashley-branded products. In 2004, both Mary-Kate and Ashley took control of Dualstar, becoming joint-CEOs and presidents of the company, which at the time had its merchandise being carried in over 3,000 stores in America and 5,300 stores worldwide. Mary-Kate and her twin Ashley's success has been marked by their inclusion on every Forbes The Celebrity 100 list since 2002. In 2007 Forbes ranked the twins jointly as the eleventh-richest women in entertainment, with an estimated combined net worth of $100 million. Following a high volume of public interest in their fashion choices, the sisters began work in collaboration on a string of fashion lines available to the public. Starting as young girls, the Olsen twins started a clothing line in Wal-Mart stores across America for girls ages 4 to 14 as well as a beauty line called "Mary-Kate and Ashley: Real fashion for real girls". In 2004 they made news by signing a pledge to allow all the workers that sew their line of clothing in Bangladesh full maternity leave. The National Labor Committee, which organized the pledge, later praised the twins for their commitment to worker rights. In 2006, in an attempt to gain credibility in the fashion industry after their association with Wal-Mart tarnished their reputations, they were tapped as the faces of the upscale fashion line Badgley Mischka. As adults, the Olsen twins have devoted much of their attention to the world of fashion. They head a couture fashion label, "The Row," as well as "Elizabeth and James", "Olsenboye", and "StyleMint" retail collections. Mary-Kate's sometimes controversial fashion choices have often found her on both the best and worst dressed fashion lists, particularly for her decision to wear fur. Mary-Kate and Ashley designed an Olsenboye Change Purse in 2011 and donated the money to "Pennies From Heaven". In 2011, Mary-Kate and Ashley teamed up with TOMS Shoes to design footwear for kids without shoes in more than 20 countries worldwide. Mary-Kate and Ashley are now the creative directors for Superga. Mary-Kate and Ashley released an Elizabeth and James perfume in Spring 2013. They won the top prize at the 2012 CFDA Fashion Awards. StyleMint is now available in the UK. In October 2012, Mary-Kate and Ashley won the WSJ magazine Innovator of The Year Award. Mary Kate was nominated for Council Of Fashion Designers in 2015. In 2008, the Olsen twins co-authored Influence, a book featuring interviews with fashion designers that have inspired the twins' fashion lines. Olsen has dated David Katzenberg, son of DreamWorks co-founder Jeffrey Katzenberg; photographer Maxwell Snow; and artist Nate Lowman. In May 2012, Olsen began a relationship with Olivier Sarkozy, half brother of former French President Nicolas Sarkozy. In March 2014, photos were published showing Olsen wearing what appeared to be an engagement ring. Olsen and Sarkozy were married on November 27, 2015 at a private residence in New York City. In 2014, Olsen competed in the Hamptons Horse Show. In 2013, her horse Marvelous competed in and won the 38th Hampton Classic Horse Show. 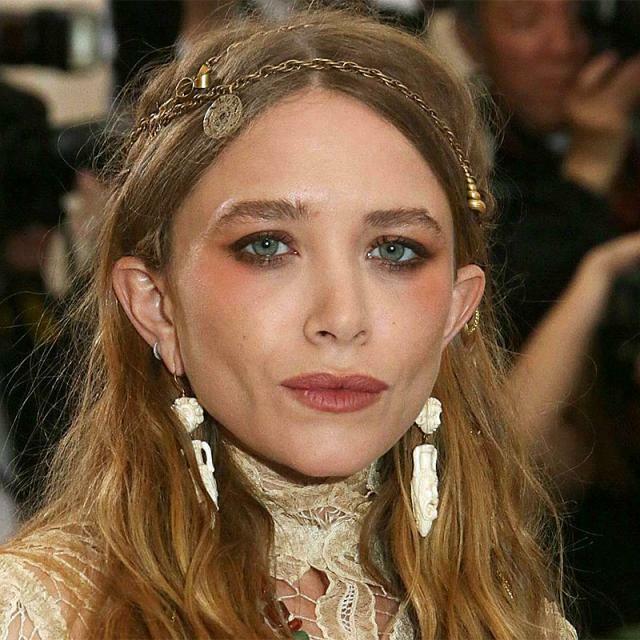 In mid-2004, Olsen announced she had entered treatment for anorexia nervosa. A Got Milk? ad featuring the twins was pulled following the announcement. On November 20, 2007, she was hospitalized for a reported kidney infection. Mary-Kate was a close friend of late actor Heath Ledger. After discovering Ledger unconscious in his bed in January 2008, his masseuse called Olsen twice before contacting police. Olsen sent a private security guard to the scene. Responding to a claim by an anonymous law enforcement official that she would not speak to federal investigators without a promise of legal immunity, Olsen's attorney Michael C. Miller said, "We have provided the government with relevant information including facts in the chronology of events surrounding Mr. Ledger's death and the fact that Ms. Olsen does not know the source of the drugs Mr. Ledger consumed".